Day 3 in New York, yesterday was Saturday and the weather was great, sunny and whilst hardly mild, nowhere near as cold as the Friday, the day I arrived. This Sunday was very moody and dark, perfect weather for cemeteries and luckily near to where Yeesan lives is Greenwood which is pretty big and impressive. I love cemeteries, they are obviously places with the potential for atmosphere, perfect for B&W and this one is not bad for that. It is a place that reminds me more of cemeteries I see outside of the UK; there the ambiance is overgrown and shadowy, often unmaintained, with the sense that not just those buried but the whole place is slowly returning back to the earth. Greenwood is expansive and not particularly secretive. I found it slightly disconcerting that they need a private security force, who drive around in 4×4. Well, we decided we had to get out and explore and this was an easy option, though photographing cemeteries is something I find quite hard, I always go in excited by what potential I see and then flounder trying to capture what it is I feel. In the end it becomes too easy to basically do a bunch of portrait shots of a bunch very patient and compliant models, I however know there is an angle I need to find to really do such places justice, maybe regularly returning is what is needed, but in Barcelona the main cemetery is one of those types made of walls where the bodies are interred and not so interesting. 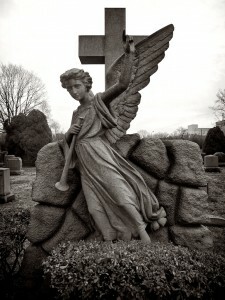 I was not in New York to hang out in cemeteries and this was my only shot at getting something usable.